“Affirmative Action Chronicles: From the Era of Colorblindness to White Nationalism,” with Cheryl Harris. 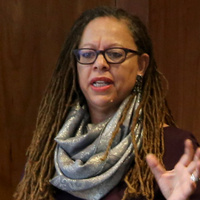 Cheryl Harris is presented in partnership with the UO African American Workshop and Lecture series, sponsored by the President's Office and faciliatated by the Division of Equity and Inclusion, and the Derrick Bell Lecture. Harris is the Rosalinde and Arthur Gilbert Foundation Chair in Civil Rights and Civil Liberties at UCLA School of Law where she teaches Constitutional Law, Civil Rights, Employment Discrimination, Critical Race Theory and Race Conscious Remedies. The interconnections between racial theory, civil rights practice, politics, and human rights have been important to her work. She was a key organizer of several major conferences that helped establish a dialogue between U.S. legal scholars and South African lawyers during the development of South Africa’s first democratic constitution. This work played a significant role in the production of her acclaimed and influential article, “Whiteness as Property” (Harvard Law Review). She has produced groundbreaking scholarship in the field of Critical Race Theory, particularly engaging the issue of how racial frames shape our understanding and interpretation of significant events like Hurricane Katrina—(“Whitewashing Race”, in California Law Review), admissions policies (“The New Racial Preferences” in California Law Review)(with Carbado) and anti-discrimination law (“Reading Ricci: Whitening Discrimination, Race-ing Test Fairness” in UCLA Law Review) (with West-Faulcon). She has also lectured widely on issues of race and equality at leading institutions here and abroad, including in Europe, South Africa, and Australia, and has been a frequent contributor to various media outlets on current events and cases involving race and equality. This lecture was fantastic! It was a privilege to hear Dr. Harris, one of the great Critical Race Theorists present "chronicles." Her use of narrative, or chronicle, to explain the issues inherent in the debate over Affirmative Action and the development of color-blindness provided a great example of the use of that methodology in scholarship both within the field of Law and outside.